All data exchanged between devices in a group during monitoring is encrypted using tried and tested encryption algorithms and schemes. Great effort has been put into securing Dormi to keep you from unpleasant surprises (e.g. intentional or unintentional eavesdropping) all too common on regular IP, or radio based dedicated HW monitors. Please consult the security section of our FAQ for more specific (and technical) details. Encoding and decoding is hardware accelerated on all Android versions (from newest down to Gingerbread - 2.3). This means minimal CPU and battery usage to process video. Each Android version introduced major video API improvements. 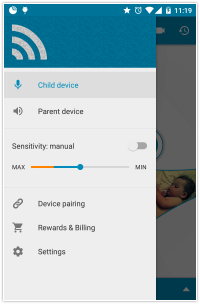 To deliver video from child device to parent device as fast as possible, Dormi takes advantage of these Android version specific APIs. The newer your device, the lower the latency (near zero on Lollipop). We extract as much information from your camera's image sensor as possible in low light conditions, using our advanced OpenGL video encoder. Processing image data in real time on the GPU enables Dormi to run adaptive dynamic histogram equalization on each frame, before passing camera data along for image compression and transmission. The new version has been designed with Google's material design philosophy in mind. Animated transitions to and from full screen video suit a purpose but also attempt to please the eye. The material look & feel is present on all versions down to Android 2.3 (Gingerbread), taking it far beyond what Android Support Library offers. Further refinements and enhancements to Dormi's smart noise detection make this feature less attractive, but to suit even unusual conditions, a new manual sensitivity control has been introduced. 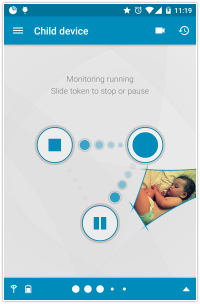 It can be turned on/off and adjusted remotely while monitoring is in progress to give it relevant context. Being among the second batch of Android apps Google featured for ARC (Android Runtime for Chrome), Dormi is already available on Chrome OS. It will become available for Chrome browser on all platforms (Windows, MacOS, Linux) soon.